Just because a major fashion magazine labels something as celebrating individuality does not automatically make it so. Discuss. Vogue. There are too many opportunities and resources available to allow you to get it right for you to get it wrong. You should be leading the fashion pack but instead you insist on sticking to the beauty standards of yesteryear and now you are lagging behind. To add insult to injury you even have to gall to subtitle the cover, “No norm is the new norm” which is laughably ironic really because all I see on that cover is the old norm. If you’re going to make a point then MAKE A POINT. Which beauty standards of yesteryear? Well Vogue, I’m glad you asked. Welcome to class, take a seat, makes notes, and no talking at the back. Non white is alright- as long as it’s not too far from white. You get marks for using models of varying ethnicities, that’s great and certainly a positive. But where are the darker skinned black models? I’m not suggesting for a moment that you shouldn’t have booked Imaan Hammam and Adwoa Aboah but like I said before- if you’re going to make a point then make a point. Leomie Anderson and Ajak Deng are two black models with dark skin and there are many others that you could have booked to really send your message home but no- you played a standard hand and the overall effect was lukewarm rather than scorching hot. Six of your models have fantastically jazzy pants but Ashley? Vogue didn’t know they could get great plus size swim shorts from Monif C and didn’t try to find out, so Ashley had to be the odd one out and wear standard black shorts because you know, it’s all about inclusivity. If the shorts are all from the same designer couldn’t you have gotten some custom made? 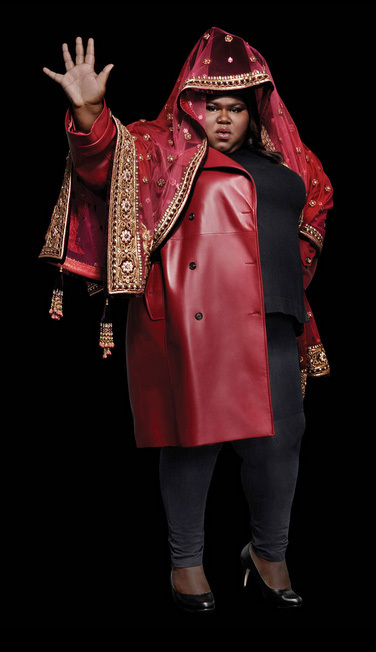 It reminds me of the time Harpers Bazaar put Gabourey Sidibe in old house leggings and Payless shoes. Next time Vogue, just email me and I’ll give you the heads up. All the other models have their hands at each other’s waists but not Ashley. Her arm is strategically placed along her thigh in a position that I believe was probably suggested so that her thigh didn’t seem as big in comparison to everyone else’s. Ashley has apparently refuted this on Insta, saying that she chose to put her hand down her thigh which of course is entirely possible but I’m unconvinced because we have seen it so often before. I see the cover as more of a gesture than anything groundbreaking which is a shame. You had a chance to truly illuminate the fashionsphere but instead you’ve just shone a humble glow. Vogue- you are a big enough powerhouse to be able to set the standard and have others follow rather than take these tentative steps in the right direction and hope you’re doing it right. Even presidents have advisors so if you’re not sure you’d better ask somebody. If you want to celebrate individuality then do so with boldness. Book models of different heights, widely varying skin tones, different abilities and OWN IT. The next time you make a fierce statement make sure your cover photo backs it up, and If you need some help, call me. I can hardly wait for this to hit the shops. I mean- just LOOK. 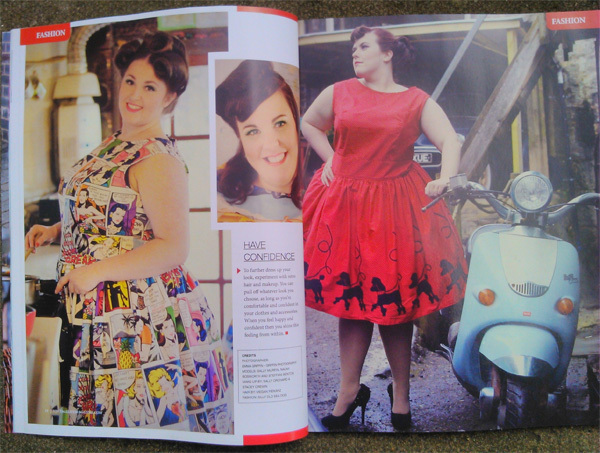 Does Vintage Life magazine usually feature plus size fashion or is this a one off? I glance through it on occasion but have never actually bought a copy until today, owing to the “Plus Size Fashion” heading on the cover. 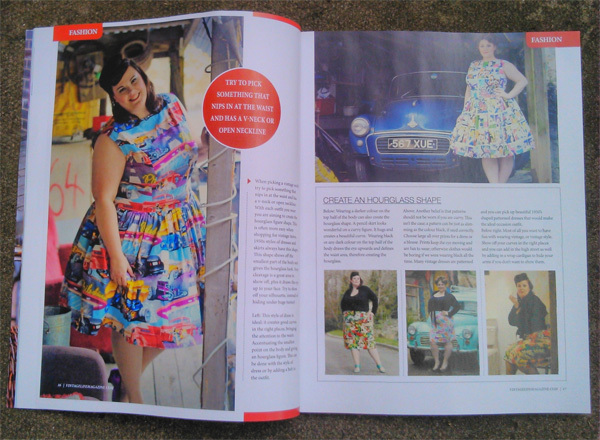 The May issue includes a feature on fellow plus size blogger Betty Pamper, and also several pages on plus size vintage clothing with a fifties spin. There are also tips for dressing a larger figure. The magazine in general is an interesting read and has opened my eyes to some festivals and boutiques I’ve never heard of. All in all, a good read for any vintage lover. Waking up to read yesterday’s Guardian Weekend magazine (my weekends are always busy, I live them in reverse) it was heartening to read Camila Batmangheldjh’s piece in the “What I see in the mirror” column. Each week a different personality writes a frank synopsis on how they see themselves and I love Camila’s description of how she gets dressed in the morning. I am happy to report that being big has its delights; I gobble up exotic fabrics, sofa trimmings and patchwork quilts, and turn them into the outfit of the day in minutes. I wear with joy brooches the kids make out of cardboard. I don’t wear pierced earrings, because disturbed toddlers pull them off your ear, so my lobes are graced with antique clip-ons and they never match. No thought to trends, playing down body parts, or considerations of other people’s opinions of how she should look. This is a woman who wears what she loves and loves what she wears- all accessorised with kiddy crafted jewellery and odd earrings. Inspiring. Every time I see Gabby in a fashion spread I sigh. This one however, is making me look around the room for the densest wall to bang my head against. In case you haven’t seen the pic already, its part of a feature from Harper’s Bazaar’s “Singular Beauties” spread which celebrates the diversity of women who don’t fit the old fusty traditional image of beauty. I get that and I applaud it. But why did they make Gabby look a total mess? I don’t even know where to begin as there is not a singular positive thing to say about any item in this “outfit”. It was meant to be a high fashion shoot in a high fashion magazine, shot by Karl Lagerfeld and styled by Corine Roitfiede. Two fashion heavyweights for goodness sake, and THIS is the best they could do? Karl L isn’t known for his love of the plus sized woman but I would have thought he’d at least make an effort on this occasion. Silly me. Carine Roitfiede is the new GLOBAL FASHION DIRECTOR of Harper’s and she should want to do a good job so she can show that the fashion direction is in good hands and she is worthy of the title. I mean- REALLY? The shoes look like they came free with a magazine, the leggings look like they’ve been washed and worn so many times that they’re begging to be put out of their misery and burned at the stake, the top is overstretched and ill-fitting, and the coat looks like it was borrowed from Kelly Price in the late 90’s and dyed red to try to make it look current. 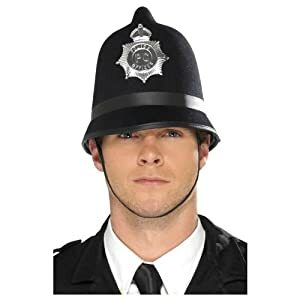 As though all this was not bad enough, the whole mess is quite literally crowned with a policeman’s helmet draped with a sari, in much the same way that you’d drape a scarf over a lampshade. Oh- and to add the final insult to an already horrific injury- a “talk to the hand” pose which does nothing to dispel the “angry black woman” stereotype- but don’t even get me started on that one. And this is Harper’s Bazaar. Shocking. Plus model Candice Huffine is also included in the spread, and looks gorgeous. Every other woman in the shoot looks spectacular too. 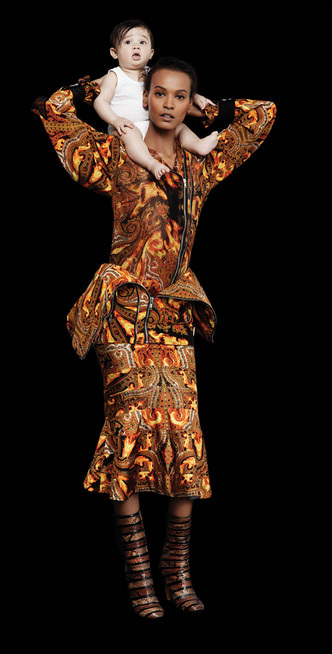 If Harper’s really cared they could have gotten something custom-made to show that the singular beauties they have chosen can all wear high fashion and look fantastic, whatever their appearance . All Harper’s has managed to achieve however, is to single out Gabby and expose the magazine as possessing the same negative mainstream attitude to beauty and dressing a larger figure, which is the precise message they were trying to contradict. FAIL. What says you, the reader? A great piece with lots of quotes from different bloggers including yours truly. Just wish I could have seen the actual paper. Am I the only person who prefers real physical printed newspapers to online newspapers? PS- And isn’t Chastity looking HOT in her Jibri outfit! ?